“I’ve switched to Verizon,” Lloyd said. “Let’s switch you to my plan,” he said. “It will save money,” he said, knowing that this is my Kryptonite. “I’m sure they will let you keep you ancient phone,” he assured me. So into the Verizon store we walked, me and old Weirdbeard. The tall, cool-yet-nerdy clerk with his tablet took one look at us and averted his bespectacled, hipster eyes. Lloyd asked, “Can we put her on my plan and keep her old phone?”. Nooooooooo!!! . I felt so betrayed! It felt like…. like going to the pet store for new cat litter but instead they kill your cat and give you a DIFFERENT CAT. 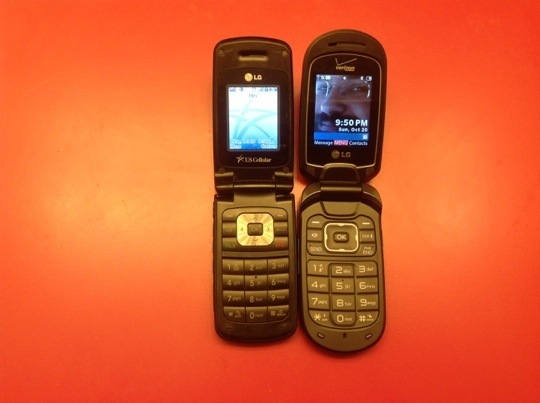 So I picked out the cheapest flip phone they had. (It’s selling point is Large Numbers.) We were transferred to Cool Lady who kept trying to give me things to make me feel better about my data-free, non-smartphone, but I rejected her snap-on case and belt clip and just waited for her to hook the two phones up to the machine that transfers all the info over to the new phone. *sniffle* I won’t let her talk to you like that, old blue! You served me well for at least eight years! Hmmm… I seemed to have forgotten the photos. Give me a few minutes. Is the phone you got called a “Jitterbug”? I almost got one of those, except I couldn’t have done any texting. I admire your valiant resistance to getting a smartphone. Once you get one, you will not be able to go back. 8 people years is like 68 in phone years. Sigh. Good bye Old Blue. I think this calls for a visit from Will. Thank you! Geez, I cut it off before the best line. Did the new phone come with the picture of Weirdbeard or was that something you added? I would think saving money trumps all the sadness. Or is that just me? Anyway, Brad is right once you go smartphone you’ll never go back. Hold on Lauren! Hold on Lauren! I feel like I should be waving a lighter back and forth. It is truly sad that song popped into my head.